We haven’t found extraterrestrial life. But we’re still finding planets circling other stars. Thousands of them. Some of those planets couldn’t possibly support life as we know it. But some might. Atomic oxygen may be a good biosignature: evidence of life. That’s what some scientists said in a recent paper. If they’re right, we may be a step closer to finding life in this universe. Looking for extraterrestrial life seemed simpler a few generations back. Frank R. Paul’s picture was an artist’s rendering of a science fiction editor’s thoughts on what Martians might look like. The Gernsback/Paul Martian was less fanciful than many imagined space aliens. But it was still more fiction than science. Scientists didn’t “believe in” Martians back in the 1930s. I’ll get back to that. Serious speculation about life on Mars wasn’t nearly as colorful as Paul’s art. We’ve known about Martian polar caps since the 1600s. We’d learned that the planet has seasons much like Earth’s by the 1800s. Improved tech brought the planet’s other large surface features into focus. Barely. The Vatican Observatory’s Fr. Pietro Angelo Secchi drew some of the first color maps of Mars. He described “channels” on the Martian surface in 1858. We call his “Canale Atlantico” “Syrtis Major Planum” these days. “Channel” in Italian is “canali.” It means any sort of channel: natural or artificial. Channels on Earth have water in them, maybe that started scientists thinking about cause-effect links between Martian seasons, channels, and seasonal color changes. “…On the earth the sea-bottoms still hold seas, on Mars they only nourish vegetation…. “…once fertile fields become deserts…. It makes a good story. But Lowell’s Mars wasn’t a good match to his era’s science. Late 19th and early 20th century spectroscopy showed little to no water on Mars. Quite a few scientists were wondering if the channels/canals were really there. Most scientists thought extraterrestrial life would be very much like life on Earth. If it existed at all. Biosignatures, indications that there’s life, seemed pretty obvious. We figured we’d find life on planets that are about Earth’s size and mass, with Earth’s temperature and oxygen in the atmosphere. All life must, scientists thought, gets energy from the sun. Plants do it directly. Other critters eat plants, or eat the critters that eat plants, and all of them end up recycled by microcritters. With sunlight driving the whole food chain. Plants produce oxygen, so oxygen in the air shows that life’s there. It seemed obvious. If that picture looks familiar, I’m not surprised. Tim Pyle’s art has been used quite a bit since NASA/JPL released it in 2014, announcing Kepler-186f’s discovery. Kepler-186f is the first roughly earth-size planet found in another star’s habitable zone. It might look like that picture. Maybe. Or maybe not. It’s one of five known planets orbiting Kepler 186. Nearly three years later, we still don’t know much more about the Kepler-186 planetary system. It’s not for lack of interest. The star isn’t particularly bright, and about 500 light-years away. That’s too far for us to study Kepler-186f’s atmosphere, or learn much of anything else about it. I figure we’ll develop telescopes and other tech that’ll ‘reach’ that far. Eventually. But nothing we’ve got now or are developing will do the job. Kepler was still in operation, the last I heard. The spacecraft’s fuel supply will most likely run out later this year. But that won’t be the end of Kepler’s story. We’re still studying data it’s been sending back, and probably will be for years. Decades. I won’t be checking on Moran’s numbers for how many confirmed exoplanets we’ve spotted. The number may have changed by Friday morning. Then there’s who confirmed them, and how. That’s a lot of work for a statistic that’ll soon be outdated. This is not the world I grew up in. Discoveries of worlds circling other stars were mostly in science fiction magazines, not science journals and a business-oriented aviation tech website. We didn’t have websites either, for that matter. The first two confirmed exoplanets weren’t the first ones discovered. Not by several decades. They were also quite a surprise. 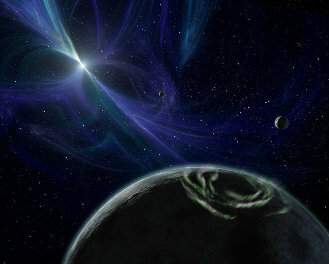 We still haven’t quite figured out how a pulsar can have planets. Not quite. Poltergeist and Draugr orbit PSR B1257+12. The star was designated PSR 1257+12 before its coordinates were updated. Except for catalogs where it was PSR J1300+1240. The “B” in a pulsar’s designation means that its position in our sky was for the 1950.0 epoch. Astronomers update coordinates every 50 years. The changes are small, but important when aiming telescopes. Shakespeare’s “I am constant as the northern star” in “Julius Caesar” aside, the “northern star” isn’t particularly constant. Mainly because Earth’s axis precesses, moving along the surface of a cone. Slowly. We’re pretty sure about that, partly from studying old star catalogs. There’s debate over who noticed what first. We’ve got a mess of old sky catalogs, from cuneiform texts like The Three Stars Each and MUL.APIN to the SAO. And that’s another topic. Newton said precession and gravity were linked. His ‘precession’ math wouldn’t work, but he had the right idea. Other mathematicians and scientists worked on the math. Then Einstein added relativistic effects to the mix. It’s been an interesting era. PSR B1257+12 is a mouthful, even for astronomers, so the star’s been called Lich. Lich is old English for “corpse.” That word’s been reanimated recently as a term in fantasy literature and role-playing games. Draugr is what my Norse ancestors called one sort of walking corpse. Poltergeist means “noisy ghost” in German. We’ve found a third planet in that system: Phobetor. The name is from Ovid’s Metamorphoses: nightmares personified. Appropriate names, I think, for a dead-but-active star and its planets. Besides being one of the first confirmed exoplanets, Draugr is the lightest of any we’ve found yet. It’s not quite twice our moon’s mass. Lich is what’s left of a star that exploded between 1,000,000,000 and 3,000,000,000 years back. Or maybe two stars. The pulsar’s planets are almost certainly as dead as their names imply. It’s one of the fascinating puzzles we haven’t solved. Yet. Michael Mendillo, Paul Withers and Paul A. Dalba say atomic oxygen ions may be a reliable biosignature. What they say makes sense. My opinion. A biomarker, for them, is something that “…can be used to identify a planet in orbit around a solar-type star where global-scale biological activity is present….” Fair enough. I’ll use the term “biosignature” instead. Other literature I’ve seen, and the National Institutes of Health, use “biomarker” when talking about “molecular or cellular events that link a specific environmental exposure to a health outcome.” It’s something used by medicos to diagnose cancer and other disorders. These scientists took a look at the one planet we know supports life, Earth, and other Solar worlds. Not Mercury, though. There’s precious little atmosphere to study there. Oxygen is part of many atmospheres. It’s usually part of a complex mix of gasses. Earth’s atmosphere, down where we live, is pretty simple. It’s nearly 21% oxygen. The rest is nitrogen. Except for about one half of one percent that’s mostly carbon dioxide. That’s not just simple. It’s a lot of oxygen. The oxygen hasn’t always been there. Microcritters started converting sunlight to energy about two and a half billion years back, with oxygen as a byproduct. What little they produced promptly reacted with iron or organic debris. Then, roughly 2,300,000,000 years back, all that changed. Likely enough, the microcritters got better at converting sunlight. Pretty soon, on a cosmic scale, there wasn’t enough stuff to absorb the oxygen they were dumping. We’re still uncovering details, but the results are clear enough. Earth’s atmosphere isn’t the same all the way up. From 90 to 150 kilometers, sunlight starts breaking molecular oxygen (O2) into oxygen atoms: ionized oxygen. It’s why Earth’s day side lights up like a neon sign. In far ultraviolet. That, Mendillo and the rest say, is unique in the Solar System. They’re probably right. They also say that Earth’s bright oxygen ion dayglow should be unique: found only in the ionospheres of worlds with plants like ours. They may be right about that. If so, it’ll make looking for ‘Earth 2.0’ easier. Not easy: easier. There’s still the matter of sorting out oxygen-generated dayglow from the planet’s sun. I also figure scientists will be discussing this. The data seems straightforward enough. What’s debatable, probably, will be how the data gets analyzed. Even if ionized oxygen isn’t a surefire biosignature, we’ll learn quite a bit from this research. And the research it encourages. I’ll give Kai Staats points for enthusiasm and a positive attitude. Like I said, points for enthusiasm and optimism. Logic, not so much. Unless he somehow knows that TESS will find a biosignature. That would take some doing, because the satellite’s job is to detect planets. Not see what sort of atmosphere, if any, each has. Or probe beneath the ice of an Enceladus analog. Maybe one or more of the stars it scans harbors life. If that’s so, we’ll find out. Later. Maybe Staats wrote something else. And then an editor with a strong preference for emotional appeal over logical integrity ‘improved’ the article’s lead. Or something happened to the file, and it got auto-corrected. Or something entirely different. Whatever the explanation, I enjoyed the article’s illustration and bubbly attitude. NASA seems nearly as enthusiastic and optimistic about TESS as the Wired writer. That may be a bit optimistic. It assumes, for starters, that the TESS mission won’t have science-stopping technical problems. But as I said last week, we’ve learned a great deal since the 1950s. Ships almost never explode before reaching space. Even the detection method has been done before. What makes TESS special — is something I plan on talking about later. Maybe around April 15. That’s the earliest date planned for launch. With upwards of 200,000 stars scheduled for observation and thousands of already-known exoplanets, I think NASA and MIT are justified in thinking they’ll detect at least a couple thousand new ones. Many of those newly-discovered worlds may have atmospheres. At least one might harbor life. That’s something we’d learn after follow-up observations. As far as I can tell, TESS is designed to detect planets. That’s all. That’s important. Data from TESS will help scientists pick which new worlds to focus on. Discovering what sorts of worlds they are? In detail? Like I said: that’ll come a little later. We’re learning a great deal about planets in general. It’s not what we expected. We’ll probably find planetary systems like ours, with small rocky planets near their sun and big gassy ones further out. We may have spotted the ‘Jupiter’ of a Solar System analog. HIP 11915 b is about 190 light-years out in the general direction of Dalim and Baten Kaitos/Tiān Cāng sì. The planet has around Jupiter’s mass and orbit. There may be terrestrial planets in smaller orbits. The last I checked, we hadn’t found any. That doesn’t mean they’re not there. Just that we’ve got more to learn. What we have found so far have been hot Jupiters, mini-Neptunes and super-Earths. Those are the comparatively ‘normal’ planets. Scientists, some of them, think we’ll be finding chthonian planets: gas giants that lost their hydrogen and helium from orbiting too close to their sun. HD 209458 b may be on its way to becoming one. It orbits a star that’s a bit like ours, about 159 light-years out. HD 209458 b is about seven tenths as massive as Jupiter, but is closer to its sun than Mercury is to ours. It’s hot. Very hot. Scientists using the Hubble Space Telescope Imaging Spectrograph found a huge extended atmosphere around HD 209458 b. The planet is shedding hydrogen, carbon and oxygen. Like I said earlier, oxygen doesn’t mean life. The planet’s surface is around 1,000 Centigrade, 1,800 Fahrenheit. That wouldn’t melt iron. But lead would be a liquid. Life as we know it? We won’t find it there. Unless we think building a refrigerated lander makes sense. Then we’ll be there. And that’s yet another topic. We’ve found enough mini-Neptunes and super-Earths to have a statistically-meaningful sample. What we haven’t found is life on another planet. I figure that’s because it’s not there. Or maybe we haven’t found it yet. Either way, I think we’ll keep looking. Someone could “believe in” Martians. Or nisse. And leave a bowl of milk out at the winter solstice. The person might even be a scientist. But that’s quite a stretch, even for me. I don’t believe in nisse. The Norwegian pixie analogs are part of my cultural heritage, but not part of the family’s current beliefs. On the other hand, it wasn’t that many generations back when one of my kinsmen was a bit too emphatic about not believing in such things. Given what we’ve been learning recently, I also don’t think we’ll find ruins of a Martian civilization. Tech left by travelers, maybe. But that’s not likely. And yet again another topic. Almost. I’ve run into folks who seem convinced that someone can’t be a Christian and “believe in” extraterrestrial life. What they apparently mean is that being Christian and thinking there may be life elsewhere are mutually incompatible. Some of them are smart, well-educated Catholics. Maybe they ran into someone who took ‘salvation by flying saucer’ beliefs seriously, and overreacted. I don’t know. My opinion about life in the universe won’t change reality. God’s God, I’m not, which suits me just fine. Part of my job is admiring God’s work. Not telling the Almighty how it should have been designed. I say that a lot. Maybe because strident foes of newfangled ideas sometimes justify their views with “religious” arguments. It’s embarrassing. My youthful encounters with ‘Bible-based’ opposition to science in general and evolution in particular left a deep and regrettable impression. It wasn’t all bad news, though. The rants sent me on a search that led me to become a Catholic. And that’s still another topic. Taking the Bible seriously is one thing. Thinking that folks knew everything there was to know when Genesis and Job were written is daft. That’s my view. I’ll grant that I see no point in basing my faith on poetic metaphor rooted in Mesopotamian beliefs. Or being upset that Aristotle was wrong about celestial spheres. Or that Newton got some of his math wrong. Or that Einstein didn’t see eye to eye with Bohr. We didn’t know everything there is to know about this universe before the Late Bronze Age Collapse. We’ve learned quite a bit since then. But we still don’t know everything. We may have more unanswered questions today. I see it as more fascinating puzzles to solve. Which likely as not will unlock still more puzzles. For someone like me, it’s like living in a cosmos-size toy store. Fully stocked. I can’t reasonably be upset that we’re learning more about this vast universe. I’ll also find truth in this universe. If I pay attention. I’m quite sure that we’re alone. That in all this vast universe, life exists only on Earth. Or that we’ll find life on other worlds. Single-celled life, but extraterrestrial just the same. Or we’ll find life on other worlds. And learn that we have neighbors. Creatures like us, free-willed spirits with physical bodies. People, but not human. If God decides to do something, it’ll happen. It’s that simple. And I’m quite sure God can handle whatever’s out there. This entry was posted in science news and tagged astronomy, exobiology, exoplanets, extraterrestrial intelligence, planets, science, technology. Bookmark the permalink. What exactly is life? Are we looking out there in space for someone who resembles us; just like the creatures encountered on Star Trek? Or could life, or living beings, be of different shapes and sizes to us; almost invisible. Is a virus life? Is bacteria life? Is life the ability to exist, feed, reproduce and die? Or should it have other essentials like the need for oxygen, water, warmth etc … What if there is life out there that does not need water or oxygen or the things we see as essential to our lives? Then my mind hurts more when it considers intelligent life. Do we measure intelligence in comparison to our intelligence? I have not some people less intelligent than my cat; are they classed as intelligent life? There are many creatures on earth who react to stimulus, or instinct; but are they intelligent? Is a seeing-eye dog helping the blind intelligent? Is an animal trained by humans to do certain things intelligent? And then my mind hurts even more when considering life “out there”; where ever out there is. Is God life? He does not eat, reproduce, or need oxygen, water or anything else to sustain Him? Are the angels life? Are the Saints (who were living once) and are now living in Heaven life? Is Satan life? I think I have said enough. I know need a Guinness to sustain my life. Those are all questions that scientists have been discussing. With various viewpoints. The last I heard, whether or not viruses are “life” hasn’t gotten to the ‘consensus’ stage yet. The things have several mechanisms and substances in common with living critters – but aren’t active unless they’re using a living cell’s functions. Bacteria – I’d say those are “life.” They’re smaller and simpler than many more familiar critters. But I see it as a matter or scale and detail: not a difference in essential qualities. Scientific and medical discussions I’ve seen apparently assume that bacteria are alive. Defining life has gotten a great deal more interesting in the last few decades. Or frustrating, depending on someone’s tolerance for uncertainty. I’m not a scientist, which hasn’t stopped me from having opinions about scientific stuff. What I think doesn’t, I trust, carry the weight that a biologist’s thoughts would. But maybe there’s an advantage in knowing a bit about a lot. Then again, maybe not. Anyway – – – I think (real) scientists are working their way toward considering that “life as we know it” may be a specific instance of “life.” There’s been some fascinating speculation recently on hypothetical life chemistries. I haven’t talked about that much, but have mentioned a bit of speculation from the 1960s: informed speculation. ( http://brendans-island.com/catholic-citizen/trappist-1-water-life/#alien ) Also a list of ‘could be, maybe’ life chemistries involving fluorosilicone in fluorosilicone on the hot end to lipid in hydrogen for really cold environments. The question of intelligence – is even more interesting, it a way. My guess is that if we have neighbors, we’ll learn that people aren’t all extremely-social – and seemingly unable to stop going over the next hill to see what’s there. That’s a big “if,” of course. I’ve talked about ‘what-if’ and hypothetical neighbors before. Maybe it’s time to dust that off and revisit the topic. Thank you Brian for taking the time to respond so fully. You have set me thinking and I may write a post about this. Excellent.I’ll be looking for that.